Pray first before opening God's word. Ask for guidance and to be able to accept what is written and to be able to apply His will to your life. Never, never read the Bible trying to proof your belief on any subject. It is only human nature to take ideas out of context. When you are reading and come across something that does not make sense, reread the paragraph or chapter again. If you still do not understand, write down the problem area and continue onward. You may discover the answers later in your reading. Start with the New Testament, people who start with the Old Testament almost never read the Bible all the way through. The New Testament is what is binding on us today not the Old. We need to follow God's will for us today not what was intended for the Jews. Forget everything you have ever heard about Jesus, God and the Bible before you start reading the Bible. Don't take what you want it to say with you first. Your voyage through God's Word will take about 5 weeks. It will be the best traveling you can ever take. You will laugh and you will cry. It has everything that makes a very good book, and lots more. It can teach you the most important things for this life and the one to come.  Site copyright© 2002-2004, Surf-in-the-Spirit. All rights reserved.